An Giang (VNS/VNA) - Smuggling has long been a pressing issue in southern provinces that share hundreds of kilometres of border with Cambodia and Thailand. With many rivers, paddy fields and thousands of easily-crossed trails, An Giang, Kien Giang and Dong Thap provinces are ripe for the illegal trade of goods between the two foreign countries and Vietnam, the online dantri.com.vn reported. 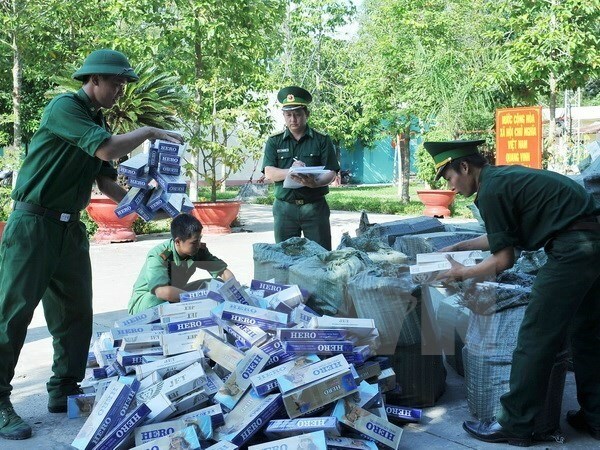 “Goods smuggling and trade fraud happens most frequently in An Giang province during the flood season,” Colonel Ly Ke Tung, deputy commander of An Giang border guard was quoted as saying. The province’s hotspots for smuggling are An Phu district’s Long Binh Town, Tinh Bien district’s Tinh Bien town, and Tan Chau town’s Vinh Xuong commune, he said. Tobacco is the most common smuggled good from Thailand to the province. Some 500,000 illegally traded packs of cigarettes were seized in the province in the first half of this year, a 10 percent increase compared to the same period of last year. Sugar smugglers use the Binh Di River between Vietnam and Cambodia in the province’s An Phu district to sneak sugar from Thailand to Vietnam, according to leaders of the customs office of the district’s Khanh Binh border gate. Some 400 tonnes of Thai sugar were smuggled into the country during the first half of this year. Smuggled tobacco, sugar and cosmetics worth hundreds of millions of dong have been seized in Kien Giang province since the beginning of this year, according to customs officials of the province’s Ha Tien border gate. Some 50 smuggling cases were discovered during the first half of this year in Dong Thap province’s Hong Ngu district, from which packs of cigarette and three tonnes of Thailand sugar were confiscated, said customs officials of the province’s Cau Muong border station. The smugglers’ tricks to slip under the authorities’ radar have become more advanced, according to customs officials. Smuggled goods are gathered near the border and then divided into smaller packages or placed together with legally traded goods, they said. Smugglers take advantage of local residents’ unemployment, their skills with motorboats and fishing vessels and their knowledge of local topography to hire them to deliver smuggled goods. Instead of keeping the illegally traded tobacco at their homes or in warehouses like in the past, smugglers now hide them in vast areas and assign locals living in the neighbourhoods to watch the goods.